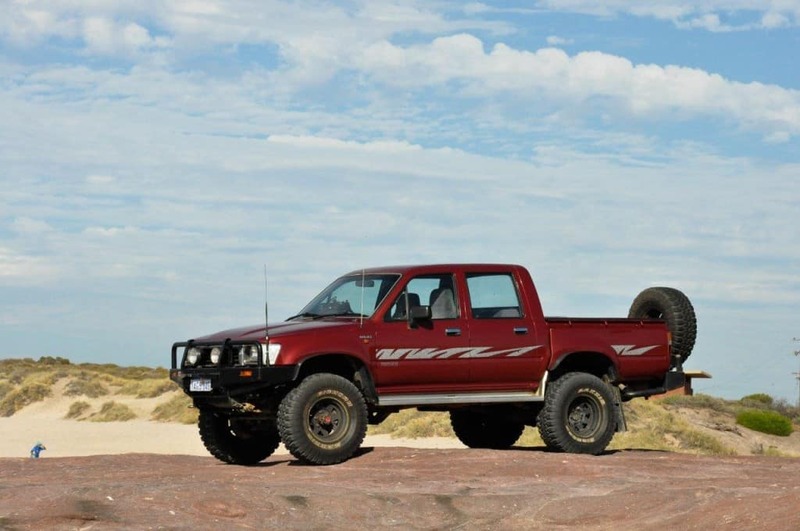 One of the most common modifications done to a 4WD is to fit bigger tyres to it. This is done for a number of reasons, but the primary one is to gain more clearance. You won’t get far with the bottom of your 4WD dragging on the ground. A lift kit will pick your chassis and body up, but the lowest point of your vehicle is always going to be your differential (except on independent suspension vehicles). Contrary to popular belief, a lift does not give you more clearance. The only way to gain true clearance is to install bigger tyres. There are a few benefits of fitting bigger tyres, which I will go into below. Remember though, every 4WD modification comes with a list of downsides too; don’t forget about them! 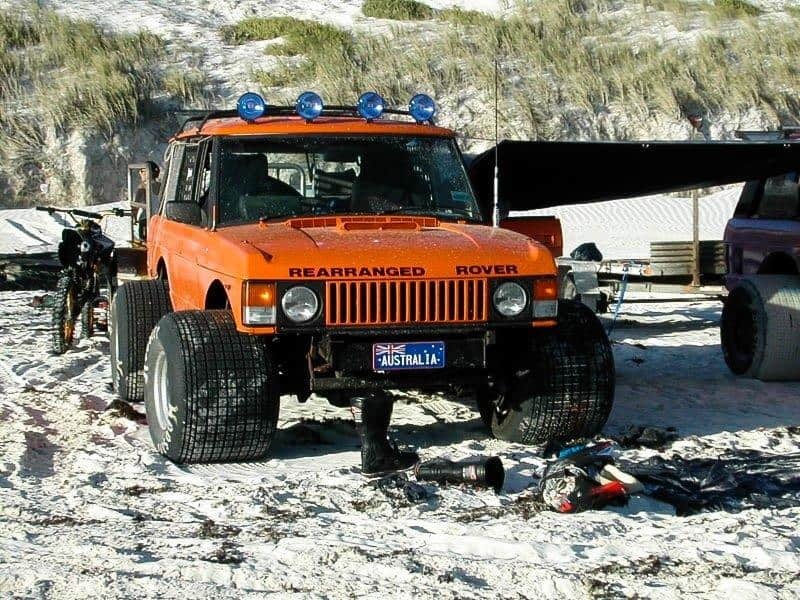 I mentioned above; the only way to truly gain more clearance in your 4WD is to install bigger tyres. Actually, I lie; you could install a set of portal diffs from Mark’s adaptors, but they are extremely expensive and out of many people’s budget. If you add tyres that are 1 inch, or 25mm bigger in diameter, the height of your vehicle goes up by 1/2″ or 12.5mm. This is important; your vehicle only goes up by the radius, not the diameters difference. Most people go for 1 or 2″ bigger tyres, giving you 12.5mm or 25mm of additional clearance. It’s not much, is it?! The bigger the tyre, the more rubber is in contact with the ground. This results in greater traction, as well as greater flotation. This is why vehicles with taller tyres perform well on the beach. More surface area touching the sand means you have less chance of sinking! I nearly didn’t put this on the list, but the reality is, some people really care about this. A 4WD that has one or two size tyres up looks better. If this is what you are doing the mod for though, I’d suggest you skip it; just get a set of muddies! I prefer function over form, but not everyone agrees with this! Lets look at this from a number of perspectives. For every 25mm bigger diameter tyre size you increase, your vehicle only gains 12.5mm of extra clearance. Say you go from 31″ tyres to 33″ tyres, you will gain 25mm. Does that 25mm really make much difference? Some say it does, and some say it doesn’t. I would say the right Tyre pressures and tread pattern would make more difference. If you go up more, from 31″ tyres to 35″ tyres, you gain 50mm clearance. This is quite a bit more, but again, nothing that Lockers wouldn’t make up for. It’s interesting to look at the drag marks left by 4WD’s; check it out next time you go off road. It gives you a good indication of whether your tyres are too small for the terrain. There’s nothing wrong with dragging a diff slowly and carefully over terrain, but you don’t want to smash it up against anything. This is where diff guards come into their own. What about the 4WD you have? This is the factor that makes all the difference. Take a 1990 model Toyota Hilux, and compare its clearance to that of a 2010+ version. They are chalk and cheese. Older vehicles, with solid axles tend to have more clearance from the factory than modern vehicles. Does this then suggest that you don’t need to go up size tyres? Perhaps! How big are your diffs? 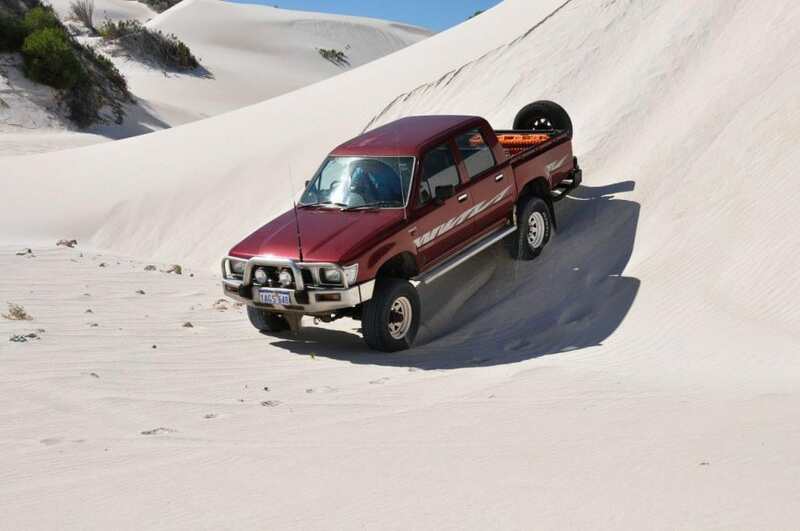 When I had my Hilux, I compared the clearance from the ground to the lowest point to that of a GQ Patrol. The Hilux had about 25mm extra clearance right from the get go, purely because it had smaller differentials hanging down. Being oversprung too, they have a huge amount of additional chassis and body clearance over a GQ Patrol. The point I am making is it very much depends on your vehicle, and where you drive as to whether the bigger tyres are worth it. Am I allowed to run bigger tyres? Please, please don’t skip this. You are responsible for driving a vehicle on the road that is safe, and legal on the road. Despite this, many people choose to ignore what the law says, and run what ever tyre size they want. You can’t legally do this, and the ramifications are very, very serious. I’m not talking about a slap on the wrist and a yellow sticker from the local policeman, I’m talking about potential jail time and mammoth medical bills to pay if your proved to have been driving an unsafe vehicle, or if your insurance company finds out and just walks away, leaving you to sort it out. In WA, you are limited to a maximum of 50mm bigger diameter increase. However, this is just the beginning. If you go up 50mm in diameter, you have lifted your vehicle 25mm and as a result are only allowed to install a 1 inch lift kit (or have the roof height go up by 25mm further). The total height that your vehicle goes up in WA must not exceed 50mm, unless you get engineers approval. This includes tyres, suspension lifts and body lifts. You can find out more about this at Is your 4WD legal? The only exception to running tyres bigger than a 50mm increase on your 4WD without engineering is if there is a different model 4WD in the same year range as yours that comes from the factory with larger tyres, and has exactly the same setup, just cosmetic differences. 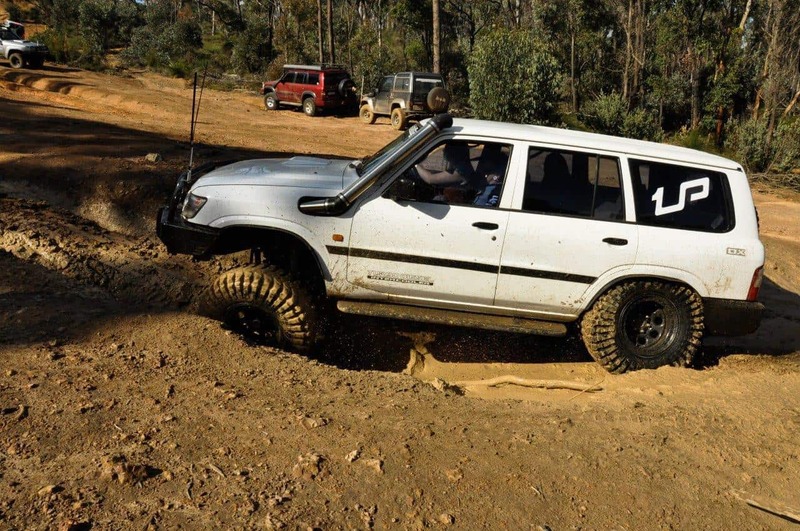 You can read about this here – Can you go more than 50mm diameter increase with 4WD Tyres? This is a can of worms. One that I am loathe to touch on, but I will anyway! When you see 3 tonne Land cruisers just idling down a super soft beach on the factory skinnies (or cheese cutters) it gives you an indication of the capability of a tall, skinny tyre. On the other hand, a 10.5 or 12.5″ wide tyre also does extremely well off road. Personally, I wouldn’t go wider than this. Remember that your traction and floatation come primarily from the length of the surface area touching the ground, not the width. Wide tyres might seem like they would spread the load even more, but then you have to bulldoze sand, mud, snow etc out of the way, just so your tyre can continue moving. This is very much a personal thing, depending on your driving conditions and requirements. To me though, there’s not much point going over 12.5″ wide. 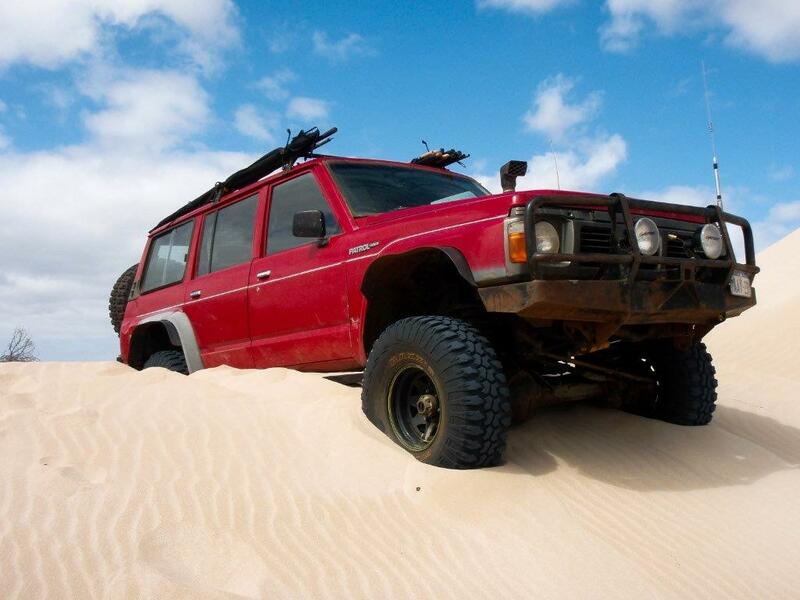 Why do so many 4WD’s run skinny tyres? They can’t be that bad! What are the disadvantages of bigger tyres? 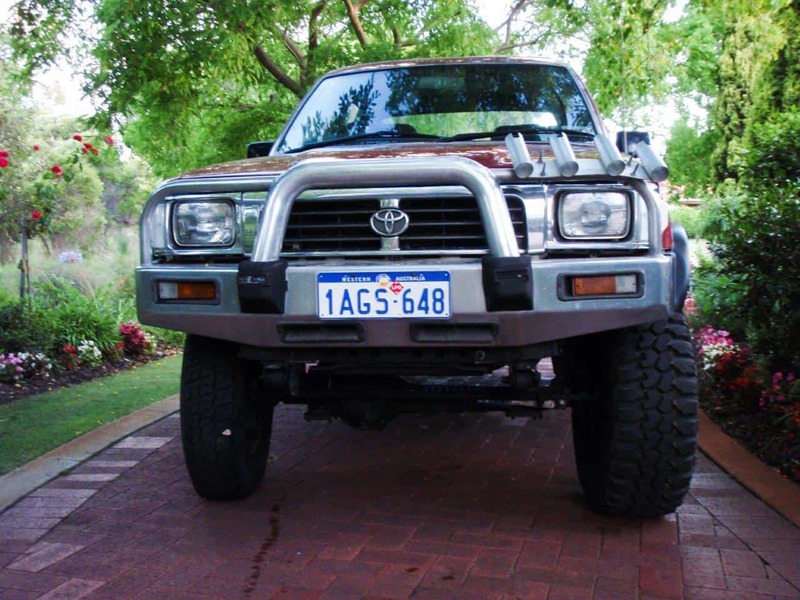 I will start off by stating our 80 Series Land Cruiser has 285/75/16″ tyres on it. This is one size up, and gives us a small amount of extra clearance. I could have gone bigger tyres, but there are many, many reasons I didn’t. There are plenty of negatives to fitting bigger tyres on your 4WD, which I will go into below. The most important thing to know when you get in a 4WD with different tyres is that the speedometer may not be accurate. If you purchase a second hand 4WD and the owner doesn’t tell you about it, you run the risk of getting a fine, or worse! Your speedometer, trip meter and odometer will be out by the percentage of size increase. If your diameter increases by 50mm (31″ to 33″ or 33″ to 35″) your speedometer will be out by roughly 10%. This varies considerably from car to car, but its something to pay attention to. By law, your speedo can only be out by 10% (seems a bit ridiculous that new cars can come out with 10% variation), but its something to be aware of. This also messes with your fuel economy calculations. 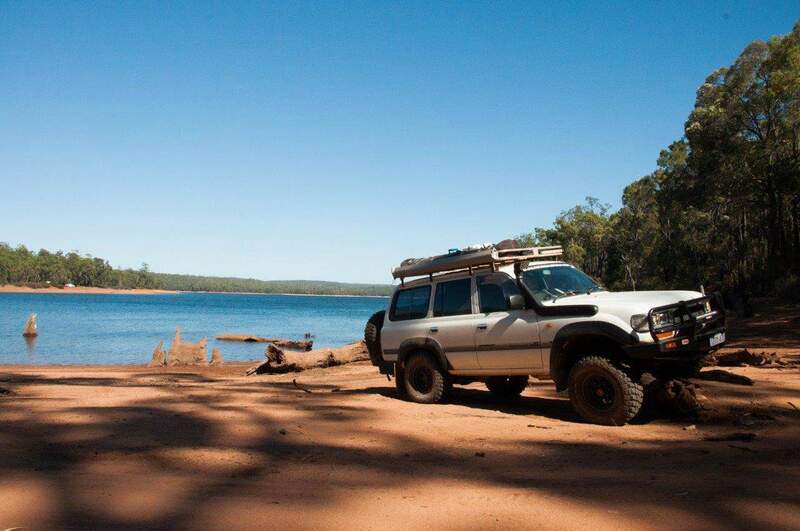 You can still work it out; have a read of this – How to accurately work out your 4WD’s fuel economy. 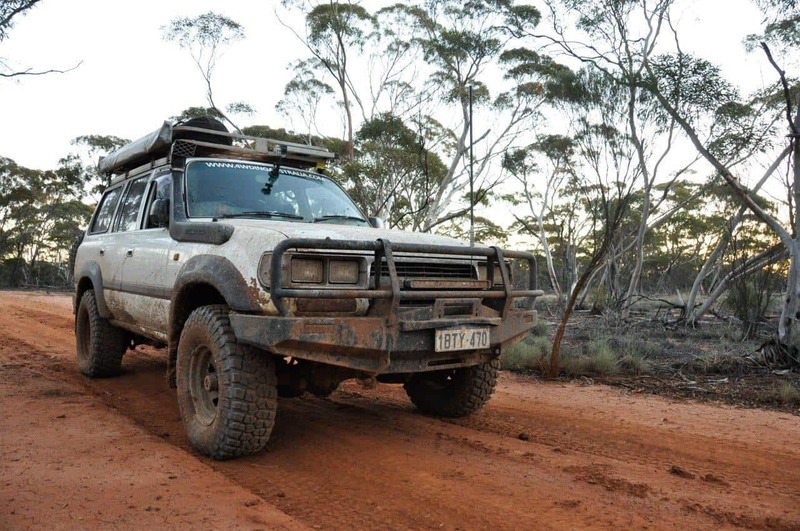 The tyres on your 4WD are essentially the last gear in your gear train. It’s not too different to changing a sprocket in a chain drive; the output power and torque will change. By fitting larger tyres, your vehicle will do less revolutions per kilometer, but it has to work harder to do so. Again, this is very much vehicle dependent, but for most vehicles there will be a noticeable difference in power and torque. In a diesel 4WD, sometimes this is less obvious as they seem to just tractor along, but it is evident. My 2.4 petrol Hilux used to lose a substantial amount of power every time I threw the 33’s on. The 80 series turbo diesel loses a bit of power and torque, but its not as obvious. The easiest and most accurate way to see what difference has been made by changing tyre sizes is to check via an EGT (Exhaust Gas Temperature) gauge. A bigger tyre makes your engine work harder, and this translates into hotter exhaust temperatures. 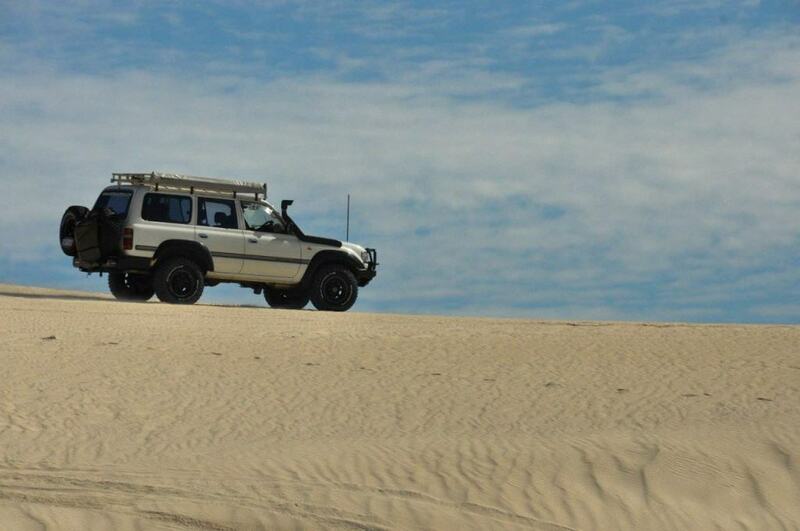 Our 80 series went up by roughly 20 degrees throughout the range when we installed the larger tyres. Possibly the primary reason for restrictions on fitting bigger tyres is the reduced braking capacity. As the tyre diameter increases, your braking capacity decreases. This is a serious concern; your brakes need to work as well as possible. So long as you stick within the legal requirements of your state though, you won’t have an issue. Everything that indirectly attaches to your tyres is put under more stress when you fit bigger tyres. This includes your CV’s, steering box, steering shafts, axles and differentials. Many people will not break components on standard tyres (especially CV’s) but as soon as they go up a few tyre sizes the breakages happen on a regular basis. Some people will argue with me here, saying it makes no difference. It may make very little difference if you are fortunate (generally the vehicles with plenty of power), but if your engine has to work harder to turn the new wheels you are going to use more fuel. When you work out your fuel economy, be sure to factor in the tyre size difference. If you do 90km on the trip meter, and your tyres are 10% bigger, you’ve actually done 99km. My Hilux went up at least a few litres per hundred kilometers, which was expected because the poor engine was already working hard as it was. The difference in our 80 series is slightly less noticeable, and I think at 100km/h it actually uses less fuel do to the revs being more centered in the torque curve. Please don’t fit bigger tyres without accepting the risk that your fuel economy may get worse! You know those yellow stickers that get handed out regularly, which basically say your vehicle is not roadworthy? Bigger tyres are one of the easiest ways to attract attention to your 4WD, and are often the reason for yellow stickers given to 4WD’s. However, a yellow sticker is the least of your worries. If you are driving a vehicle that is not compliant with the local regulations, your insurance company can walk away from any claim you make. If you rear end a Ferrari, or you seriously injure yourself, you could end up with a massive bill that you have to pay. Even worse, if you are found to have caused an accident that injures (or kills) someone because of the bigger tyres (or other illegal modifications) you could even go to jail. It’s not worth it – do things by the book! There is a reason that 4WD’s come out with the tyre size that they do. You might be able to fit the next size tyres on your 4WD, but go a couple of sizes up and things will start to get tight. The first thing you will notice is that the tyres foul on the inner guards (usually at the front) or the bull bar. If it is only minor scrubbing you may be able to get away with it, but remember to consider when the suspension flexes upwards it will move closer to your guards. 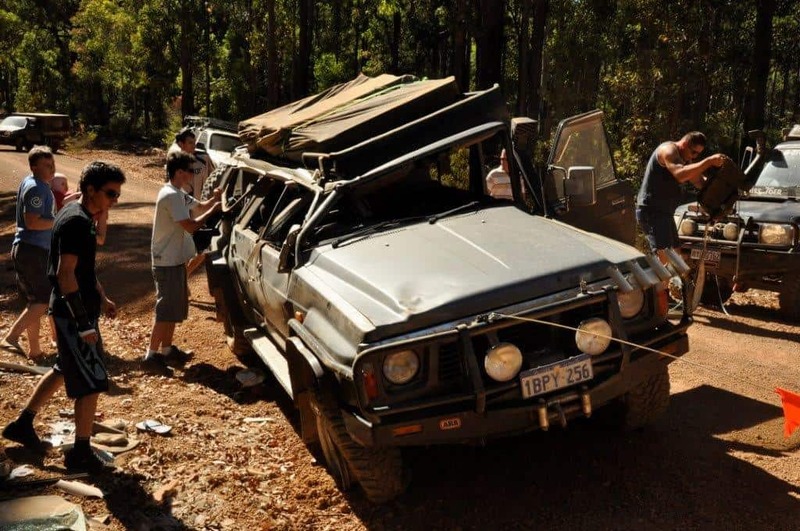 The only way to fix this is to modify the 4WD, which isn’t impossible, but its a steep slope that is hard to stop yourself on in both time and money. Bigger tyres usually result in further modifications. People find they aren’t happy with the power difference, and start looking for mods to make their vehicle make more power. If the tyres don’t fit properly, the next step is suspension or body lifts, or to trim the guards. 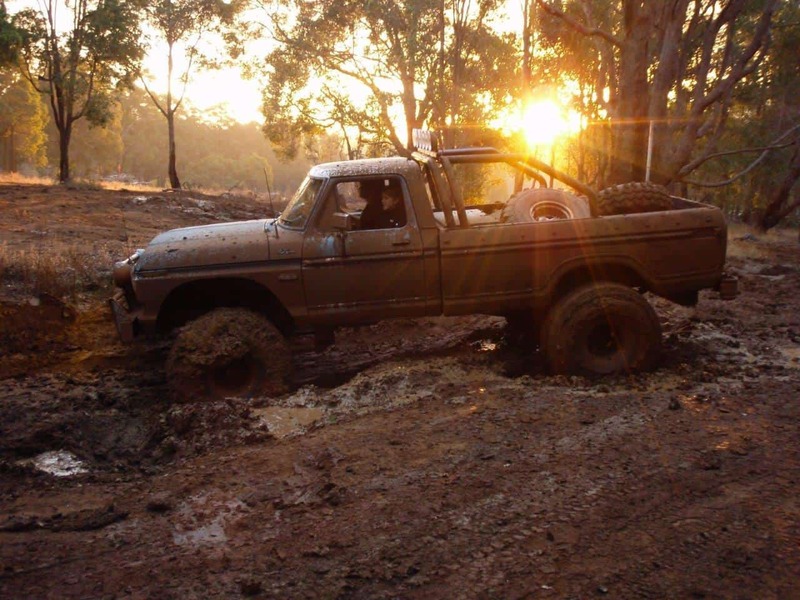 Believe me; once you start this slippery slide of 4WD modifications, there is no getting off! I don’t say this to put you off installing bigger tyres, just to make you aware of the potential expenses down the track! The ultimate 4WD has a low center of gravity, and plenty of clearance. For every size tyre that you go up, your center of gravity also goes up, making it more likely for your vehicle to roll if something was to go wrong. Ultimately, bigger tyres are fitted to make a 4WD more capable. The thing is though, there are many ways you can do this. For example, a locker will make your vehicle immensely more capable. If the decision came to it, I’d keep my vehicle legal and install a locker instead. Having installed ELockers not too long ago, I know they have made our 80 series a lot more capable than the tyres ever did. Another alternative is to change the tread pattern. Muddies will give you significantly better traction than road or all terrains. However, match the terrain you drive on the most to the tyres you buy. As always though, this all comes down to your individual circumstances. Where you drive, how often you drive, how far you want to go etc! What size tyres should I run then? The tyre size you end up with should suit your driving. A 6 inch lift and 35 inch tyres might look good, but it’s not really suitable for touring around Australia. How often do you need bigger tyres? Could you get away with something else? I usually suggest one or two sizes bigger than factory (if this is legal) with some decent tread (muddies or all terrains). Above all, stick within the legalities; its not worth the risk. Looking for something else to read? Have a look at 42 things you must know about 4WDing. 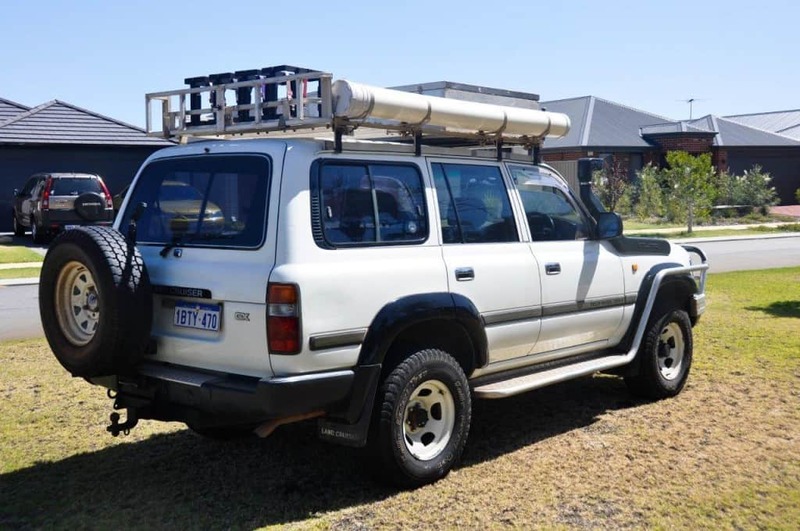 Hi mate, I have just bought this Hilux back from Melb and will be installing the new ARB BP-51 shocks and springs this will give me a 50mm lift and the SR5 wheels are 17’s now so I am putting all terrains on, at the moment it has 265-65-r17’s and I am going to 265-70-r17’s , going by your thread on here i will be at the maximum legal limit, is this correct. If I am right, the tyres you are fitting are 26mm bigger in diameter, which means your vehicle will go up 13mm (half of the diameter) as well as the 50mm lift. A total of 63mm, which would be over the maximum limit. You can only raise the roof height of your vehicle by 50mm, which your lift is doing. I would measure the vehicle and see how much it actually goes up by, and see how you go. Interesting, I will measure it and let you know what the outcome is, did you get the info from the department of transport ? This is very informative especially to me, a newbie driver to off-roading. I guess I have to try out my vehicle’s capability and stick to 31″ tires. I decided to go with the same size as the tires that came with my FJ Cruiser but a little bit more aggressive. Then see from there if I need more upgrades. If I do go up from 31″ to 33″ tires, will it scrub against the fenders of my FJ? I’m very hesitant putting a lift kit on my FJ. I can’t tell you for sure whether it would rub or not, but you’d be best to see if you can find someone who has installed 33’s. There must be a few forums around? Alternatively, the most likely place for them to scrub is on the front guard, right where your feet would sit in the front two seats. If you turn your steering to full lock, you can measure the gap between the rear of the front tyre and your guard. From there, imagine the tyres sticking out an extra inch. Would it rub? Why compare lockers with clearance? Lockers won’t give you more clearance, and more clearance won’t give you more traction. For most people, getting bang for your buck is very important. A lot of people don’t have the money to buy both lockers and clearance, and if you can get away with only doing one, why bother doing both? It makes sense to pick the best option, which is exactly why I compared them. I’d get lockers any day over a lift kit. Tyres will lift everything – your differential, chassis and body off the ground. However, only by the increase in radius. 2 inch bigger tyres means you only get 1 inch of clearance. Usually in order to fit bigger tyres (more than 1 size up) you need to have suspension modifications, unless you look at chopping the guards. What scrapes on the rear? Have you got a nice rear bar that improves your departure angle and takes the hit? Yep, its always a compromise. Why not wait until your tyres are worn out? Have a look on newhilux – maybe you can fit one size up without touching the suspension at all? The other option is to replace my Running Boards some Rock Sliders, that way I’ve at least got some under body protection. This is true, but your transfer case will still hang down low. Bash plates? I own a Hilux DC the same type as yours. Are you sure your tyres are 205/70/15? That is way smaller than the standard size. I have 265/75/15 on mine and it works fine. I have recently bought, a 2012 hilux ute, second hand. It has 31 inch wheels and is fitted those rims which are filled with holes and are not greatly appealing on the ute. Do you know where I could get the rims changed into the traditional hilux rims. And there’s wheel size inflation. Popular tracks get rutted and so folks fit larger wheels. The tracks then get dug out deeper, and so on. Plus those with smaller wheels have to find an alternative route so you get a mess of braided tracks. No wonder the land managers resort to gates. It’s interesting to see the changes to 4WD Tracks; I’ve been going to places around Perth for many years now and plenty are vastly changed every time I go there. They tend to get worse over winter when things are very slippery, and then gradually recover in between. That said, tracks that do get hammered a lot eventually get to a point where you’d be hard pressed to drive them in anything but a seriously modified 4WD. Fortunately, some of these are graded and then the process begins again. You’ve got to respect the environment though! Wow i thought only Norway was crazy when it came to tyre restrictions on vehicles, but we can actually get up to like 46″ tyres on legally if you put some work in to it and dig deep in to your pockets. Lifts arent a problem either as long as they are TÜV Approved (germans). Yep, things are pretty strict over here, that’s for sure. It appears America has much more freedom to modify 4WD’s as well! In WA you can get up to 150mm lift with engineering, but that’s it. Ironically, you can bring a vehicle in from overseas for a trip in Australia and it can be wildly illegal; just has to pass basic roadworthy tests! Great article. Sage advice. I have a 1991 Hilux Dual Cab 2.8 diesel, which does have a 2 inch lift. This offers some fantastic approach and departure angles. As well as great clearance over very steep water bars. But I’ve essentially stuck with close to the original diameter tyres. I have upgraded from the factory skinny rims to a set of 225/75/16 BFG AT’s on sunraysia rims. This has widened the stance just slightly and improved the road cornering stability/confidence. Living in the Alps year round, this little vehicle has constantly amazed me with how well it managers the terrain. Many a time it has out performed specialist snow vehicles over snow covered roads and trails. in fact i goes a whole lot better in the snow with the BFG’s without chains than the skinnies did with chains. And in the summer months it handles all of the high country trails in a calm measured manner. And still get just a hair over 10 litres per 100k’s on the highway. And It still fits comfortably in to 2.1 meter basement carparks when i visit the city. However, it does struggle with automated parking station gates and some traffic lights. They just don’t sense the vehicle when I approach the gate/line, apparently because its too high. Great to hear. The 2.8 Hilux’s are fantastic vehicles; light weight, nimble and economical. I had a 22R one and was amazed at where it would go too. Good to hear you are having fun with it! I’ve also got an 80 with 285/75/16 tyres. I’m seriously considering though a switch to 255/85/16 as I’d prefer narrower tyres but to keep the height. You wouldn’t be the first person to consider doing that. I don’t know how much of an affect it would make on capability, but it would give you better fuel economy. I guess those tyres are much less common as well though, so if you had to replace one in the bush you might have issues. This is probably the stupidest question you ever been asked but iam new to 4wdrivin etc. I purchased a brand new vw amarok with 245/70r16 tyres with 16×6.5inch rims. I want to put 265/65r17 all terrain tyres with 17×8inch rims. Will this modification be illegal in Qld and how will this affect my fuel, speedometer etc. I would really like your input on this PLEASE. Iam mostly gonna do brisbane/city driving but would like to take it offroad nothing serious tho obviesly. Great article, learnt heaps from this, just wondering if you can answer a question that has been playing in my mind. what are your thoughts? what will coppers and insurance companies think of this when they see my placard compared to my wheels? Great. You are most welcome. You are allowed to go 50mm diameter bigger with your tyres from the largest tyre size in your model range, providing the changes between the models are only cosmetic – nothing changing with the brakes, suspension, driveline, etc. Remember that the vehicle only goes up by half of the diameter increase; its only going up by the change in radius, not the change in diameter. 2 inch bigger tyres will lift the vehicle 1 inch. You can increase your wheel track by up to 50mm, providing your tyres are completely covered; so flares might have to be the go. Confirm the exact tyre sizes across the models, keep a copy of the tyre sizes run on the different hilux’s, use the online tyre size calculator to make sure you are on the money and then if you are still happy, get the tyres fitted. As long as you are within the bounds of the law the insurance can’t do anything. The police can give you a hard time, and could give you a yellow sticker (but they can to any vehicle on the road, even with engineering certificates). Unfortunately there is sometimes a gap between what the police know and whether you deserve a sticker or not. Hi Aaron. You have so much info, thanks, its been great reading. I have a Freelander 2 2009 with 235 55 R19 105v. Perelli SCORPION VERDE™ ALL SEASON tyres. 80% Road 20% off road. I have so far been adjusting my tyre pressure, no punctures to date, if I feel it’s not safe I turn back. I have just found 235 55 r19 105H General GRABBER AT3 that are 50% road and 50% off Road. The speed rating is lower. I will check with my Insurance Co to see if I am covered as well as with the road authority, your advise is excellent, I would not have thought to check that. I would like your thoughts about changing to the Grabber At3. I would say I am doing 70% Road / 30 off road. That’s mainly graded dirt roads 80% and 15% tracks and 5% sand / mud / snow. I carry only one spare and a puncture kit plus a small recovery kit. Thanks to you I am heading off to check about recovery points and to get a recovery hitch for the tow bar. I am not yet into full off road as you are, one step at a time, my main concern is punctures when heading from lake Eire to Cameron’s corner. I have driven the unidatta track with the perrille’s. (No issue) I would have my pressure around 25 to 30psi. I just can not make up my mind to go for the Grabber over the perrelli and could do with your thoughts. Plus most of my travel is as a single. I do carry a Spot Gen 3 tracker for emergency notifications/ request for assistance and family can see my location and movements in real time as well as the CB radio. O and I do have a fold up shovel, I am now going out to buy a full length shovel. Lol. So thanks for every thing, a great read, full of info. I look forward to reading your thoughts. Sounds like you are having fun – great to hear. Tyres are a compromise – one that works well for a certain situation won’t be as good for another. I would primarily ensure they have a light truck rating. The more aggressive the tread, the noisier they will be on the road, the worse your economy will be and the less well they will handle on the road. That said, life is a compromise and a good set of all terrains are about as good of a compromise as you can go. The General Grabbers have a good reputation, as does the Toyo Open Country AT II. I don’t know much about the Perelli tyres unfortunately. I would say for good condition gravel roads it won’t make much difference. I would also consider swapping rims; see what other smaller rims will fit (depending on brake size usually) and you may find you can run a more common tyre size. As long as you have a puncture kit, you don’t let your tyres get too warm and drive to the conditions you won’t have an issue. Do you have a full size spare? Thanks Aaron. Good advise. For the time being I am going to stick with the Perrelli tyres. Will see if I can get hold of some new rims as you suggest. Yes the spare is full size. You are welcome. Run the Perrelli’s out and go from there. I currently have an stx navara which has 18x7j factory wheels. The current tyres are 255/60/18. I am getting mixed reviews on whether I can get 265/65/18 (this is a much more common tyre size for ATs) on those same wheels. Some shops saying the wheel needs to be at least 7.5” wide and others saying it will be fine. What’s your opinion, and most importantly, what’s the maximum width legally allowed on a 7” wheel? The 265/75/16s are 28mm bigger. If the tyres come within 14mm of the guard they will touch. Also make sure the offset of the rims is the same.